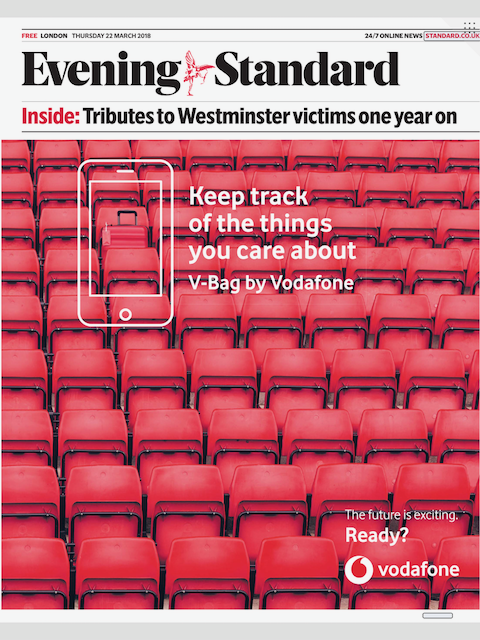 A week ago I was encouraged by a series of full-page ads in the free evening commuter paper in London – the Evening Standard to take a closer look at a new family of devices from Vodafone aimed at the consumer Internet of Things (IoT) space. I’ve been using the excellent Tile bluetooth trackers for a while – placing the wafer-thin devices in my wallet, laptop backpack and even my checked luggage so I know if my bag is about to appear on the luggage carousel. 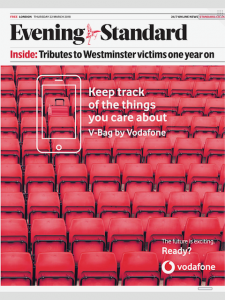 The Vodafone V-Bag goes one step further than the bluetooth powered Tile devices. The beauty of the Tile is that it has a battery life of over a year, and is certainly a “set and forget” device. The Tile can be located if in bluetooth range (it is paired with your phone), and if you lose your device it is then located in “Lost mode” by using a mesh network of all the other connected Tile users. For more long-range tracking, any device needs to be able to connect to the outside world, beyond the 100m range of my phone via bluetooth. 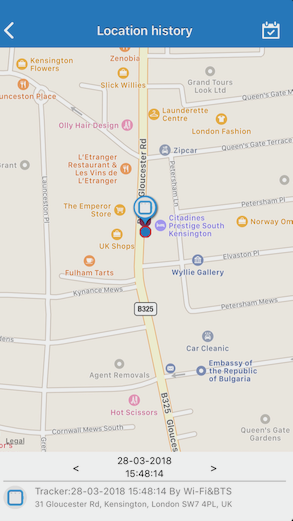 As someone who was deeply involved in the location-based services (LBS) space for a number of years – and the reason I now live in London, I am always keen to try new location-powered initiatives from operators such as Vodafone. A number of “smart luggage” products have hit the market that contain an inbuilt GSM radio and SIM card, however, have fallen foul of dome airline regulators because the Lithium-Ion battery in these devices cannot be removed, and therefore cannot be placed in the hold of an aircraft because of a potential fire hazard. 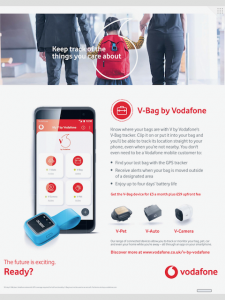 The Vodafone V-Bag gets around these limitations because it can be removed from luggage, and also easily turned off before boarding an aircraft, or the luggage being checked into the aircraft hold. So how does the device perform? It arrived a few days later complete with all I needed to get up and running, including the new V-SIM, designed for the V-series of smart IoT powered devices such as the bag tracker, a pet tracker, a car tracker and also burglar alarms. The box contains everything I needed including the V-SIM and it is I believe the first device I have owned where they included a tiny screwdriver, to allow you to install the Nano-SIM in the waterproof housing. The instructions were a little hard to follow and it took more than 30 minutes to get it all working, and I have two Electronic Engineering degrees! What I eventually worked out is first you have to download the Vodafone V-SIM app and activate the SIM, then you have to download ANOTHER app (not on the App store as being written by Alcatel – the device manufacturers) from “TCL Communication”, and there are also 2 apps called “MoveTrack” in the app store. The Vodafone app is slick, iPhone X compatible and has all the clean red Vodafone branding you’d expect. 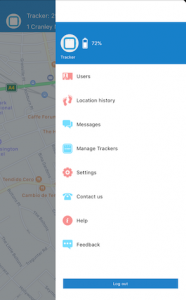 The TCL MoveTrack app that you need on a daily basis to track the location of the V-Tag is a very poorly written app. The UI belongs in the 1980s, it constantly says it “cannot find the server”, and I’m my mind distracts from what is a great offering from Vodafone. Vodafone needs to urgently get the app rewritten if they want this offering to gain mass appeal. Once I got through all the hurdles to install and activate, the device does what it says on the tin. It can check the location every 3, 5, 10, 30 or 60 minutes – the longer time between checks means the battery lasts longer. Checking every 5 minutes, I expect the battery will last for around 4 days before needing a recharge via a micro-USB cable. 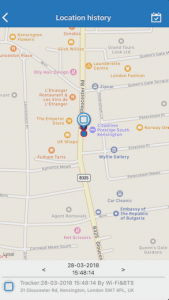 The device itself from Alcatel claims to get location via GPS, WiFi and LBS, the latter meaning cell-tower triangulation which is the least accurate of all three methods. Inside the device, it contains a 2G radio, operating on the (soon to be closed down in some countries) 850 / 1900MHz frequency band. I assume the data is sent at GPRS (56KB/s) speeds. It does not need high-speed data as every location update will simply contain a latitude/longitude measurement, along with the accuracy level (GPS/WiFi/LBS) indicator. 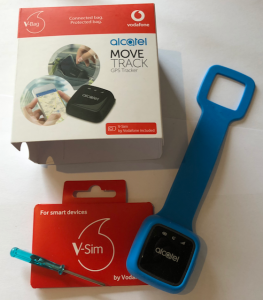 At £59 to purchase the device then £3/month on a special “V-SIM” tariff that won’t allow you to use the SIM in any non-IoT device, it is a little on the pricey side in terms of the monthly SIM subscription. I can suspend the monthly charge, and at the moment I can roam with it for free in selected EU countries, but not elsewhere I travel such as the US and Australia. I’ll revisit this post in a few weeks, but I would hold off getting one until Vodafone get the MoveTrack app rewritten and perhaps embed the activation process in their own app rather than needing 2 separate apps which is overkill in my view. For this jet-setting, gadget-loving Practical Futurist, I now have another toy to play with on my travels.